So, after a bumpy start (Canvas rejects Twitter widgets), I finally got a good set of dynamic content pages set up in my practice Canvas course. 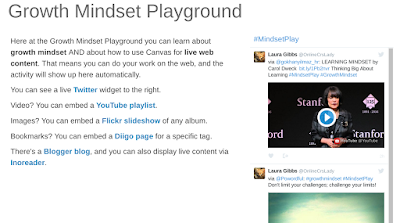 I made it public, so this link will take you there: Growth Mindset Playground. I found a hack to make the Twitter work after all (weird, but functional), plus it's easy to do YouTube, Flickr, Diigo, Blogger, and (my personal favorite!) 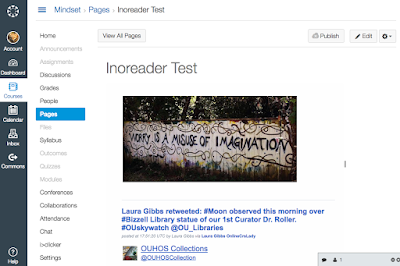 Inoreader. I don't really have any interest in using Canvas for a "course," and I don't have any interest in creating content in there, but these live content pages are different. Instead of creating content inside Canvas (I far prefer other publishing platforms), I am creating and curating content in real spaces on the Internet, and that content is then automatically displayed in Canvas. I don't have to do anything: it's automatic! So, when I use Twitter, the tweets show up in Canvas. When I add a new video to the YouTube playlist, the playlist is updated. When I add new images to the Flickr album, they show up in Canvas. When I bookmark with Diigo, it's in Canvas. New Blogger blog post? It's in Canvas. New RSS items? Inoreader will display them in Canvas, along with other social network content, including Google+ and Facebook. To me, live content is something extremely important to include in an online course. 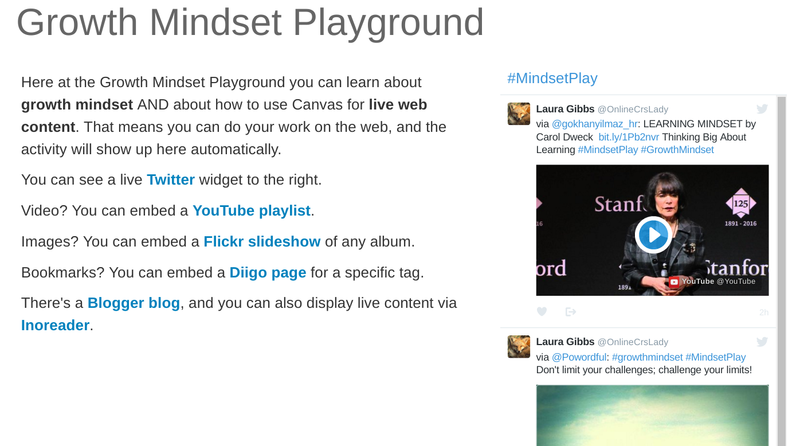 Using live pages, you give the students a steady stream of new content to explore. This might be content that the instructor(s) create/curate, or you can have the students also participate in creating and/or curating the content as well. It all depends on the goals you have for your course! In future posts, I'll have more to say about these specific content sources and also about content creation and curation. For now, though, I am really happy that I was able to get all this live content up and running. Even better: I am so glad to be able to share the pages with everybody... that was never possible in D2L! 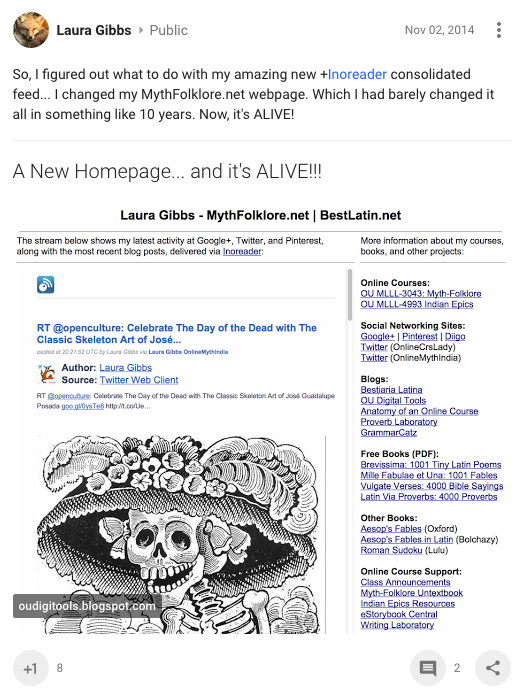 This is going to be great motivation for me to work on a really good Inoreader stream, and of course that will be available via the Mindset.MythFolklore.net page I created, totally aside from Canvas. Whoo-hoo! I wanted to try one more Canvas test, and after the dismal Twitter test, I was not optimistic... but look at this: the HTML clippings for an Inoreader RSS feed render without any problem. Isn't that awesome??? So, by using Inoreader's rules and active searches, I will be able to create some seriously awesome dynamic pages in Canvas: live content coming to you from the real Internet. Who needs Twitter when I have RSS??? Well, I was excited to get started learning about Canvas, but my first effort is a bust. I created a new Twitter widget I want to use, which works fine here (see below), but when I paste it into a Canvas page (HTML editor), I just get gibberish. Not a good start; I'll come back next week. I'm happy to play with Canvas on a weekend if it's going to be fun, but not if it's going to be annoying, ha ha. Sigh. Instead of a faux Twitter widget, I would like a real one please! There was another great confluence of three articles today (what's up with that??? see this trio from a couple weeks ago: Bootstraps, Literacies, and Iron Cages), so I'll do what I did last time, laying them all out to see how they resonate. Maybe they will resonate for you also. Thanks to the serendipity of G+/Twitter streams and streamers today for providing a good weekend reflection! I'll start with this one from Edutopia because it is a great lens through which to see the other two: Teacher Collaboration: When Belief Systems Collide by Elena Aguilar (thanks so much to George Station for sharing this one at G+!). Self-Actualization: Those who believe in self-actualization believe that the purpose of teaching is to bring out the unique qualities, potentials, and creativity in each child. They value student choice and self-directed learning and are keen to provide for students' unique and multiple needs, interests, and developmental tasks. Aguilar's premise is that conflict arises between belief systems, and then that conflict grows worse without a shared vocabulary for articulating our belief systems. If we did have a shared vocabulary, we could articulate our underlying goals and priorities, and that could turn the conflict and misunderstanding into an opportunity for growth. I would say that is definitely a problem at my school, and I would also say that I feel in a minority as a "self-actualizer" ... although is that really true? Until we actually have discussions where people share their beliefs (and the forums for that are few and far between; there are none online), there's really no way for me to know. Even better, Aguilar suggests that we have these discussions with our students, as you can see here in the closing paragraph: "I offer these descriptors to you in the hopes that they'll spur some conversations and reflection. Maybe these definitions of beliefs don't even resonate. Then I hope that this compels you to consider and define what you believe is the purpose of education -- and to also ask others that question. And, also, maybe ask that question of your students." That is something I definitely want to do! I have no way to really initiate conversations with colleagues (I work remotely), but I'm able to have lots of discussion with students. Over the years, I've built a lot of self-actualizing features into my classes, and I can see that resonates with some students more than with others... and with some students it doesn't resonate much at all. Perhaps by giving them a framework like this to articulate their expectations for the class, it will help me to find better ways to accommodate their needs. Given that self-actualization means I really want to reach the students where they are, it would help me to know if I should be building more cognitive features into the class (I can do that! ), more academic rationalism (yes, I can do that too), and so on. That all resonates really nicely with Laura Gogia's reflections on IndieEdTech with her emphasis on the Indie, not just the EdTech: I am #IndieEdTech — and thanks to Adam Croom for the perfect pull-quote in his tweet: Being indie means being yourself in the presence of and in relation to others. Let me be clear: my #IndieEdTech is not about personal APIs. It’s about how students and faculty interact with the open web and how we can explore it together. Individuals who lack a voice in or whose needs are not met by the establishment will separate themselves from it. They begin to explore (or innovate) alternative approaches. Indie involves thinking differently, not necessarily better. Indie implies risk. It is inherently diverse. Indie is about organic upstarts, each with a do-it-yourself ethos and a dedication to trying something different. None are exactly the same. For an added bonus, Laura has a really fascinating indie film narrative that complements the indie music narrative that Adam et al. have been developing re: Reclaim Hosting. So, I can definitely wave that #Indie flag, even if I really don't even want to label myself as edtech at this point anymore. 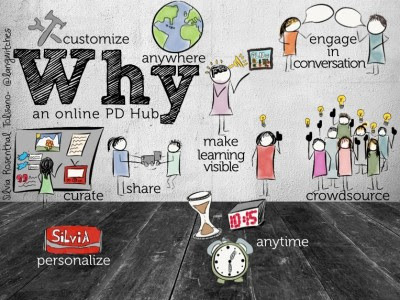 Can I be #Indie without really making it about ed tech at all...? The issues that I really need to work on as a teacher are cultural, political, institutional, personal — in short, they are not necessarily technological. As for tech, well, just speaking for myself, the ed tech problem feels more or less solved, with a tech landscape that is dramatically different than it was in 2002 and getting better all the time. But the teaching landscape... uh, not so much. It feels basically the same as 2002, and just as frustrating. Moreover, as the framework in Aguilar's article points out, there are plenty of academic philosophies whose agendas are not very indie-oriented, even before we put tech on the table. And that leads me to this third article and the new battle for personalization... which is starting to look a lot like the old battle for open, with indie and anti-indie forces awkwardly using some of the same vocabulary. This last one is actually an old article from 2014, so thanks to Teresa Mackinnon for sharing it this morning at G+ exactly when I needed to see it! ): What’s the dif? Personalization, differentiation, individualization by Adisack Nhouyvanisvong. If you look at the way personalization is presented in that article (and it is the main focus), the definition has strong elements of self-actualization and student agency: "The learning objectives are different for each student, and a student has a voice and actively participates in designing her own learning model. The student takes ownership and assumes responsibility for her own learning." That sounds pretty good, right? In her post, Laura Gogia cautioned against equating indie with student agency, but it's still true that student agency can and should be a part of indie... and at least in terms of this particular definition of personalization, there is considerable student agency, self-direction, self-actualization, etc. All good. Yet if you look at the actual example provided in the article for personalized learning, it did not seem to involve real student agency at all: "In a high-school government class, I observed students given a short chapter quiz at the beginning of class. The teacher quickly scored — he has able to do this because they were using an online assessment software — and reviewed the results of each question with the entire class. The teacher and students engaged in meaningful and constructive discussions about each question, ensuring that the students knew and understood the concept being asked in each question. Students then submitted exit tickets about the main points they learned and concepts they still struggled with before leaving the class." A quiz? A discussion? An exit ticket? Now, my guess is that the teacher of that high school government class is really just struggling with the practical problem that a classroom presents: if the way you are engaging with the students is in the confines of an "all-here-together-at-the-same-time" model, it's natural and maybe even inevitable to drift into a "we're-all-doing-the-same-thing" model as well. 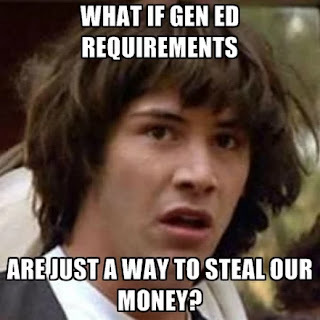 But what if students want to study very different aspects of government? What if they don't all want to talk about the same questions that come from the same quiz? It's very hard to allow for that in the confines of a traditional class, which is why I have personally found it so liberating to teach online: it seems much easier (in my experience) to try to live up to the ideals of personalization when you escape some of the practical confines of synchronous classes. Nhouyvanisvong is less interested in differentiation, contending that it is just about teachers putting students into groups (really? ), and individualization also gets short shrift as if it is only about accommodations for summative assessment (really?). So, in the end, this article raises the very important question of understanding these words — personalization, differentiation, individualization — without being able to really tell us what they mean so that we could confidently use them in conversation without the fear of being misunderstood. And that was back in 2014! The situation is even more complicated now that the word "personalization" has been caught up in the hype machine. So, like I said, the real problem I face is not technology... it is vocabulary. 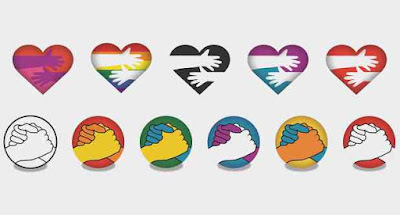 And the lack of discussion that would elucidate the meaning of those words in ways that would help make us all better understood to ourselves and to each other. Which means the more we talk about the meaning of indie and personalization and agency and so on, GREAT. I'm all for more discussion... and even if it's pretty darn hard to have online discussions with fellow faculty at my school (although I keep hoping), there's always lots to talk about with students. Which means I'm already getting excited about what Aguilar's framework might offer as part of the process of jumpstarting next semester's classes. If I can find out more about what students might expect from me and from the class (what are their beliefs? ), then I can find more/better bridges between those expectations and what we can accomplish together! 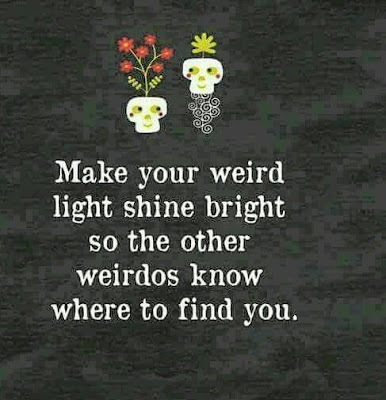 so the other weirdos know where to find you. Could we find a way to let freedom be part of every child’s life? Could we find a way to allow our kids the chance to take risks? The chance to do things wrong? The chance to screw up? [...] In short, start treating your students as humans — as citizens of a learning community — and stop treating them as detainees who are in your school for training. George then asks how this applies to LMS participation (following up on a conversation we were having earlier with Phil Hill at Google+), and it is a very good question indeed. What would lead to greater LMS success: a learning community, or training? I say: learning community! The problem in my opinion is that we are expecting the LMS and its features — and training in how to use those features — to lead to actual changes in the way faculty both design their courses and teach them. I just don't see how that will happen. If you want to see changes in course design, then we must have discussions ABOUT course design. That's not something that you do via a "training session." It cannot be top-down and scripted, one-size-fits-all. Instead, it has to come from the bottom up as each instructor finds their own design. But we can help each other as we pose our own design questions; that is what a learning community is for! So too with teaching: if you want to see changes in people's teaching, then we must have discussions ABOUT teaching, not just "training sessions" focused on LMS features. To transform people's teaching, we need sustained self-reflection along with conversation and sharing, over time. In a learning community. Will the coming year see a learning community take shape... or just LMS training? Well, here is the challenge I would like to make: let's start by not assuming that the LMS is even going to be the best choice for every goal. In fact, let's not assume it is the best choice for any goal. Let's ask instead: given my goals, what are the best tools for me to use? So, let the learning community come first and drive the training sessions as needed. Don't let the LMS feature set drive the discussion, and don't assume that OU Create is the "other" default. Bring it all to the table! No defaults: instead, let's discuss from the ground up and see what we can learn. And how to do it...? 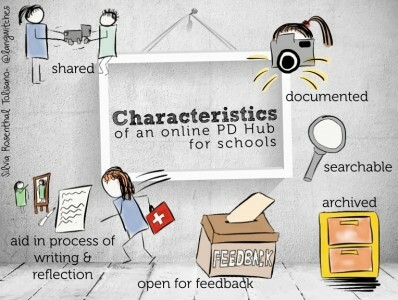 There are lots of ideas here in this series from Langwitches: Building a Professional Development Hub for your School. Note that they are advocating an online hub. If we want everybody to be able to participate (faculty, students, everybody), and if we want to grow that network over time, we need some kind of online hub: online there is room for everybody to participate along with a real opportunity to grow incrementally over time, iterating and reflecting as we go. So... what would be the hub? I'd love to see our campus Canvas advocates build that hub USING Canvas. What a great way to show us to what extent Canvas can indeed be used to support a learning community, while also allowing us to discuss and document other options if/when it turns out that the LMS is not the best tool for a particular goal someone has for their own class. This is an idea I proposed during the Canvas pilot a couple of years ago, but there were no takers. I wonder if we can try to build a community this time? Just think how cool it would be if training emerged from that community and was supported by that community. I'm glad to a very active member, sharing everything I know about student blogging, RSS, and related topics, while learning from others' experiences in their own teaching and learning experiments. Meanwhile, I'll keep sharing in the only public online network we have right now, which is Twitter. The hashtag connects us: #OU_LMS16 is where you'll find me. But if the Canvas advocates build a space for networking and learning together IN Canvas, you can sign me up. I would be delighted to give it a try! 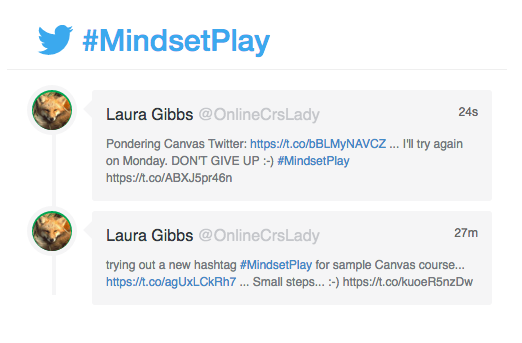 For more LMS-related posts at this blog, including Storify for the #OU_LMS16 hashtag at Twitter, click here: OU LMS posts. This week I read not one, not two, but three articles that really made me stop and think, and I'm going to try to do some serious blog-pondering this weekend as a result. The first step: sharing these three great items! The first item (by Michael Berman) is an old post I had missed the first time around, but it has reappeared at just the right time; the second item (by Catherine Cronin) is the beginning post in a series, and I'm excited to read more; and the third item is from a blog (by "Torn Halves") that is completely new to me, and I can tell I need to read more here. I am one of those hardy souls that Michael mentions here: "A few hardy souls jump at the exciting possibilities afforded by teaching in the online environment, but it’s more common to find a combination of reluctance, dread, fear, uncertainty and even downright hostility." 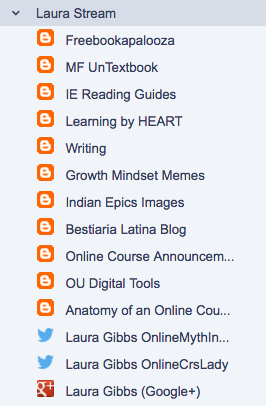 I've been teaching fully online since 2002, and I have nothing but good things to say: I love it (Devotedly Digital). I'm also aware, though, that FUD is a much more typical response by faculty at my school who are teaching fully online, esp. if the other classes they teach are traditional face-to-face classes. Making matters worse, the advent of online has coincided with some real threats to higher ed faculty, with a very unfortunate result as Michael points out: "Online education has become associated in many people’s minds with these economic and political forces, and the myth that online models such as MOOCs will destroy traditional models of higher education, within a short period of time, is promulgated by lazy media and self-promoters." So, it's a mess. A massive mess. Even if we can overcome and/or sidestep all the negativity (and that's a big "if"), where are the positive models for people to follow? Here's Michael again: "Success in a new endeavor depends on a belief that you can succeed. The first step in becoming a successful online instructor is to be able to imagine yourself in that role. When you never had the experience of being a successful online student, with an online instructor who motivated you and cared about you and believed in you, you are going to have a really tough time believing you can be that kind of teacher yourself in an online environment." Michael then goes on to explain what they are doing at CSUCI with "Humanizing Online Instruction" and all the great things Michelle Pacansky-Brock is doing. Michael's conclusion in the end is optimistic, but requires patience (more patience than I have...): "In ten or twenty years it will be a lot different. We will have faculty who will remember that online instructor in high school or college, the one that really cared. The one they chatted with about their deepest fears and hopes, the one that believed in them when no one else did. And those teachers will not find it odd in the least to become online teachers – it will be a natural progression. But until we get there we will have to help give our instructors great online experiences and models if we expect them to be effective at teaching our students." I am so excited about the way Catherine Cronin's PhD research is coming together, and I'm also grateful for her generosity in sharing it here via her blog, with more posts to come: "The working title of my PhD research study is Exploring open educational practices in higher education. I’m currently at a ‘pausing point’ between phases – so I plan to write a few blog posts to capture my findings and thinking so far and where I’m heading next. This is the first of those posts." I need to start using this acronym OEP! Catherine points out the range of practices it might include here: "I’m using a broad definition of OEP which includes the creation, use and reuse of OER, open access publishing, the use of open technologies, open learning, and open/public pedagogies in teaching practice, with the goal of enabling learners and teachers to share the processes of knowledge creation." If we think of OEP as a multidimensional spectrum in that way, I've definitely an outlier at the open extremes, which is only natural: I've been teaching these fully online courses for a long time, and from the start it is been my belief that the more open the courses are, the more they will succeed. I have not had any reason to change my mind about that in the past 15 years of teaching online; in fact, I believe that more strongly than I did starting out. Catherine, however, is not working with faculty who teach fully online. Instead, she has interviewed faculty who are teaching either face-to-face or blended courses, not fully online, which means she has been talking with teachers who are not always sold on open, perhaps for theoretical reasons or practical reasons, or both. What emerged from Catherine's interviews with faculty were four processes that she can associate with faculty's use of OEP: "valuing social learning, balancing privacy and openness, growth mindset re: digital literacies, and challenging role expectations. All four processes were evident for each of the participants who used OEP for teaching." Of these four, the one of the most interest to me is "growth mindset re: digital literacies," and Catherine discovered that faculty digital literacy has consequences for the other processes (not surprisingly): "Having a growth mindset re: digital literacies relates to the previous process: balancing privacy and openness. Staff with highly-developed digital literacies are more likely to have the confidence and skills required to manage privacy settings, negotiate various social media tools, and operate with agency in complex social media ecosystems." I am especially interested in learning more about the faculty who are not interested in pursuing digital literacies (whether or not they embrace OEP), and apparently there is more to come about this in the next blog post. The reason this is of particular interest to me is because of the real breakthrough I've had this year in making growth mindset an explicit part of my classes (more here). My classes have always been focused on asking students to learn a lot about writing and about online technology, and for many students is a big stretch; my students are not necessarily interested in writing (these are Gen. Ed. courses, drawing students from all the majors at my school), and they are also not necessarily interested in online technology (they are usually taking the course online because of a schedule conflict, not out of a preference for online learning). I used a growth mindset approach in my design and teaching of the class, but until this year I had never made that explicit with students... and the results of making growth mindset an explicit part of the class have been great! Several students mentioned in the Fall course evaluations that learning about growth mindset was the most important thing that happened to them in the class, and I have some real growth mindset enthusiasts in the class again this semester. Based on the students' eagerness in the Fall, I expanded the experiment this Spring to include a related set of challenges that I nicknamed Learning by H.E.A.R.T. (Health-Empathy-Attention-Reading-Time); yeah, the acronym is admittedly dorky, but it was a good way to pull together a lot of assumptions and practices relevant to my classes so that the students could set more challenges for themselves. I'm excited about taking some time this summer to look back on both experiments to see where I want to go with that next year, and I'm also curious to read more about what Catherine has found in her research with faculty. For me, the contrast between student and faculty receptiveness has been night and day: I have found it a wonderful experience working with students on digital literacies over the past many years, but during the two years when I worked as a faculty development "liaison" for our campus IT department back in 2001-2002, I never enjoyed that sense of success. That, in fact, is why I resigned my job in IT and started teaching online courses — the best career decision I ever made. I learned about this amazing blog from Simon Ensor, and I clearly need to go back and read all the posts in this blog. I wish I knew the name of the person lurking behind this apparently Adorno-inspired pseudonym (? ); I guess I will just think of him as TH for now. This post was especially useful for me in the context of recent screeds by Alfie Kohn, Rolin Moe, and Paul Thomas against growth mindset. Because their posts basically equated growth mindset with grit and/or with corporate ed reform, they did not get at the big issues that appear here, although I suspect this is part of the larger point they were trying to make. TH does not mention Carol Dweck or Daniel Pink (my two self-realization gurus of choice), but instead focuses on Ken Robinson as a way to get at the problems with the whole "self-realization" enterprise. As he goes after Ken Robinson, TH uses the metaphor of the iron cage (from Weber, as he explains) and he contends that we could subtitle Robinson's books as Learning to Love the Iron Cage because "in helping the individual to make the best of a bad situation they persuade him or her to yield completely to that situation, thereby affirming a state of affairs that really deserves criticism." TH then launches a three-staged criticism — "1) a post-Protestant view of work, 2) a one-sided concern with the individual, and 3) the exclusion of any concern or thought for the ends of our collective activity" — and it is those second and third items (individualism and collectivism) which are of most interest to me, and which are paradoxically bound together as the rise of the personal also becomes the rise of the impersonal with rampant individualism dehumanizing the collective: "Thus the rise of the personal and the rise of the impersonal are two sides of the same coin. In trying to heighten the personal character of our lives we create a society with a public character that is overwhelmingly impersonal and dehumanising." Of course, I want to say that my insistence on open education is an attempt to imbue growth-centered education with a public character. But is that really true? And is that enough? Or . . . am I really just a troll? Not troll-as-in-Internet, but troll-as-in-Peer-Gynt, as TH explains: "Ken Robinson must have read Ibsen’s Peer Gynt. Surely he remembers the distinction Ibsen makes in the play between the properly human notion of being true to yourself and the troll dictum: “Troll, to thyself be enough”. What Ken Robinson is really doing is repackaging the advice of the trolls. Following your passion without any sense of duty or obligation or higher calling is utterly troll-like. The word “true” becomes little more than advertising copy used to give a pseudo-human spin to a product of the trolls." Ouch again. Are my classes truly human? Or are they instead the pseudo-human product of trolls...? Put less harshly, but more pointedly: is the freedom I try to promote in my classes completely undermined by the compulsion which brings students to the classes in the first place? My students are taking the class as a Gen. Ed. requirement, an iron cage of sorts which we pretend not to notice, but see this meme (from a blog post by one of my students). So, if I were to say to the students (as I dare not say), "You do not HAVE to do anything for this class provided you have paid your bursar bill for which you will receive 3 units of Gen. Ed. credit," then would anybody do anything for the class...? Except for the one or two students each semester who aspire to be professional writers, I would probably not see any of the students once I opened the door of the cage (assuming, of course, I could convince them that my opening the door of the cage was not just a trick, as some of them are at first suspicious of my choose-your-own-grade approach to grading). Customers, prisoners, slaves: take your pick of the metaphors. Are my students just happy slaves? And me too: am I just a happy slave? And am I really prepared to be satisfied by contending that happy slaves are better than unhappy ones...? (I do, after all, prefer my happiness now to the professional unhappiness of my previous job.) Or should we be talking about our liberation from the cage that we do not even talk about? The challenge from TH is this: "If we were to come across a happy slave, we would wonder whether it might not be better to help them to see their slavery for what it is, even if this might make them less happy. If, like Weber, we are troubled by the perception that we are all now in an iron cage, there are good reasons for not wanting people to be perfectly happy with the current state of affairs – for wanting people to draw strength, not from their personal adaptation to the cage, but from their ability to come together to challenge it." So, in the end, TH calls Ken Robinson to task for not even acknowledging this larger problem in the midst of dispensing self-help advice: "what is most appalling about the Element books is Ken Robinson’s quiet message that there is no need to try to make sense of the world. If the iron cage had ears, that is precisely the message it would like to hear." Lots to ponder here, and as I continue to ponder this post (and read more in this blog), I will make that a challenge to myself also: if the reason I teach the way I do is because I find the usual ways of university teaching to be nonsensical, and because I have doubts about the business-as-usual business of higher education itself, then I will continue to say so more often and more loudly. 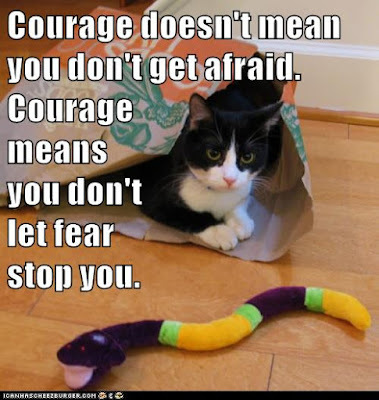 And just because I usually do that with LOLCats instead of Adorno, that does not mean it is a laughing matter. It is an altogether serious one. 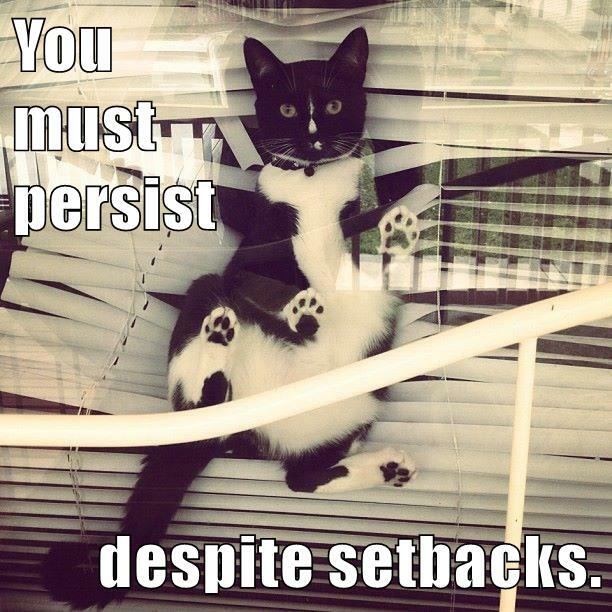 I will persist despite setbacks ... and with thanks to Michael, Catherine, and TH (via Simon), who all gave me such good stuff to ponder this week! 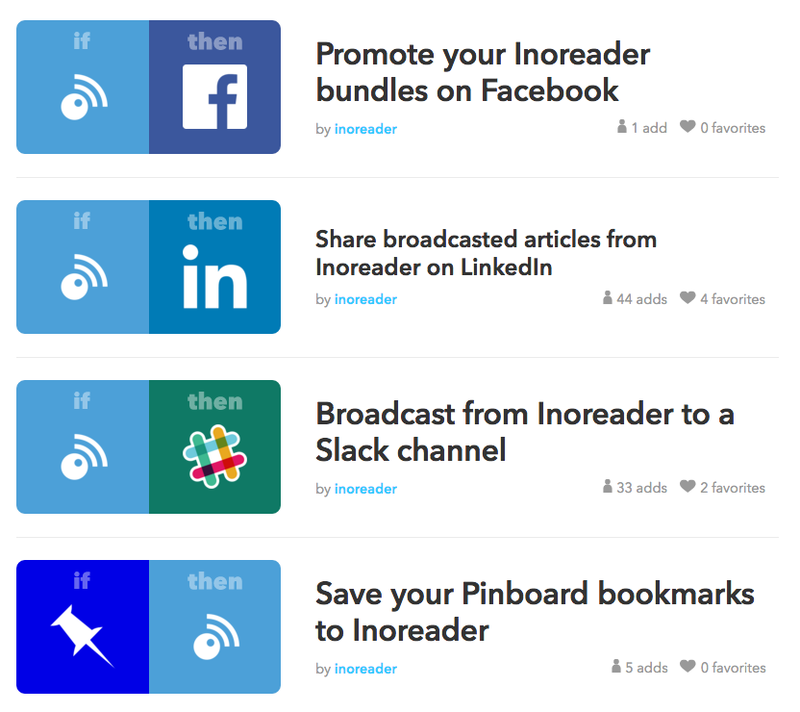 Yesterday I wrote up a guide to how to use Inoreoader to create a personal RSS stream: Inoreader: Remix Your Own RSS Feed ... with social network content. You can see my personal stream at MythFolklore.net. As someone who teaches online and who is dedicated to using the Internet as an educational space, I consider that personal stream to be the equivalent of my "open office door" or, if you prefer, my door with all the cartoons and articles and such taped to the door as some faculty do. So, here's how the Inoreader curation process works for me...and if you are looking for a better curation process, maybe you can find some strategies here that will work for you too! Step 1. Create a stream-to-curate folder. I explained yesterday how to create a combination feed by putting feeds in a folder. You can put whatever feeds you want in your stream-to-curate folder! Because I am so active every day at both Google+ and Twitter, sharing and resharing content there very diligently, I can rely on my own Google+ and Twitter streams (I have two Twitter accounts) as the content I want to curate, so my personal stream is also my stream-to-curate. If I were not using those networks so diligently, though, I might include some other people's blogs, Twitter sources, Inoreader active searches, etc. in my stream-to-curate folder. It's all up to you; there are so many ways to add content to a folder in Inoreader! Step 2. Create rule to assign a tag. I also explained yesterday about how useful it can be to create a rule to add a tag automatically to all new items in a folder. To manage your curation process, create a rule that adds a tag to all the new items in your stream-to-curate folder; the tag I use is notbookmarked. I can also manually add that tag to any item I happen to see in Inoreader, although I am not likely to do that; I usually share good content at Inoreader at Google+ which means it ends up in my stream anyway. But the option to manually add the tag is always available too! Step 3. CURATE. When you have time (a little time, a lot of time, whenever), review the notbookmarked tag in Inoreader. There is no rush: Inoreader saves the contents patiently; even if you just have time to do this once or twice a month, that's fine. Work through the notbookmarked items, deciding what to do with them in order to get them in a more permanent place IF you want to keep them, re-use them, re-share them, etc. As you process each item, either putting it somewhere else or deciding to discard it (I discard more than I keep), remove the notbookmarked tag. This does not remove it from Inoreader, and it does not remove it from your stream-to-curate folder. Instead, it just removes it from the heap of stuff you have not curated... yet. And that's all there is to it! There is no rocket science here; all you are doing is setting up a good stream and getting Inoreader to tag it for you so that you can ponder later, at your convenience, what is really worth keeping. So simple: which is why it works! Limits to Automation. Since I value what I learn from the curation process, I'm not really interested in automating my process beyond that one use of IFTTT. The manual aspect of the process is something I actually enjoy! When I sift through the items at Inoreader, I get to "relive" each day, which is a powerful process in and of itself. I decide what to keep and what to discard, and when I keep things I decide where to put them. The item might go on my Myth-Folklore or Indian Epics or Writing Pinterest Boards, for example, or I might save articles to my Growth Mindset Resources at Diigo, etc. Pinterest and Diigo are both the repositories I turn to when I have more substantial free time, taking items saved there and turning them into blog posts. That process of revisiting items again and again (first at Inoreader and then later at Pinterest and Diigo) allows me to see what has real value to me, with the most valuable stuff ending up in my blogs, and those blogs are, in turn, another way for me to reshare my curated content with others. 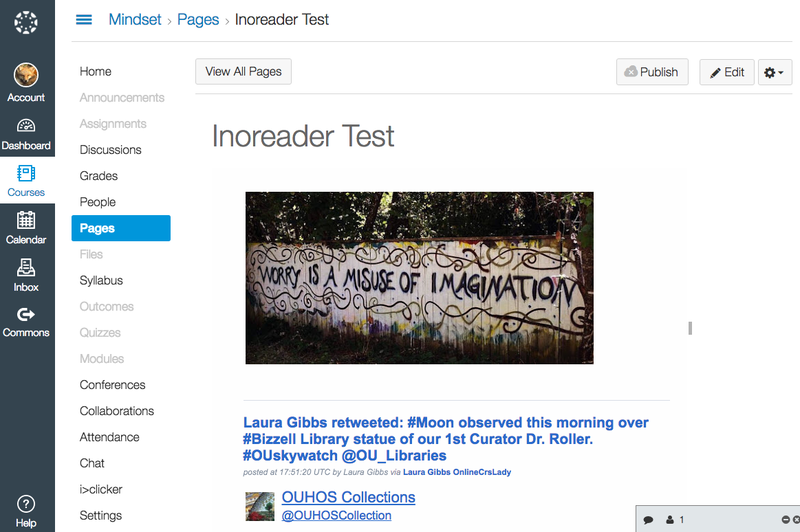 A Twitter convo this morning with Josh Birdwell has prompted me to write up something about how I use Inoreader. I really should try to document more of the ways I use Inoreader because it is now my #1 essential tool both for teaching and for all my own projects. Thanks to Inoreader, I am now curating every day, keeping track of the huge flow of content that I read via my blog network (including student blogs) and also at Twitter and Google+. I'll write more about Inoreader as a curation tool in a separate post; my focus today is on using Inoreader to remix content for an outgoing combination RSS feed. Remix RSS and More. The ability to remix RSS is very cool (remember YahooPipes? ), but Inoreader takes that even farther because it also harvests non-RSS content from social network feeds at Twitter, Google+, and Facebook, rendering them as RSS. It's magic: you can recombine any of the content in Inoreader to send back out as an RSS stream, including social network content that is normally not available as RSS. 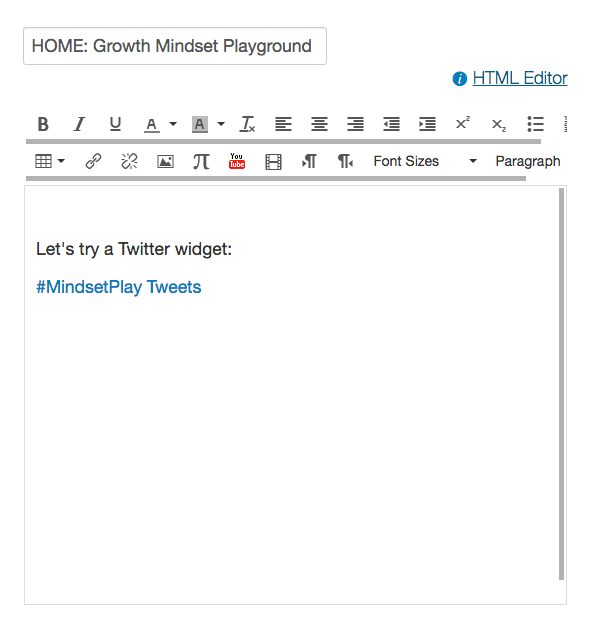 Want an RSS feed of your Twitter? Facebook? Google+? Easy-peasy: you just subscribe to your feed with Inoreader, and then send it back out again as RSS. Personal Combo Feed. 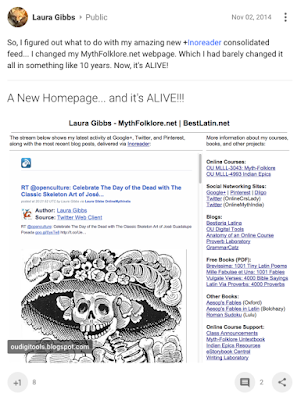 What I do is actually to COMBINE all my different blog and social network feeds into a single outgoing RSS stream which you can see here on my homepage: MythFolklore.net. If I used Facebook (I don't), then I could have my Facebook in there too. There's other online activity I could include as well (other blogs, Diigo, Pinterest, Flickr, YouTube), but for various reasons I have left all that out, although of course I could change my mind about that at any time and add them in by add any of those subscriptions to this folder. Export the RSS. So, how do I get from that folder of content to my combined RSS feed? I could just export that folder as an RSS feed (you can send out any folder as its own RSS feed), but I add an extra layer of control by using a rule that automatically tags new items in that folder with a tag, lkgrss. Why add that extra layer of a specific tag? Because it means I can manually remove something from the feed if I want (by deleting the tag from any item) or I can manually add something to the feed (by adding that tag to any item). 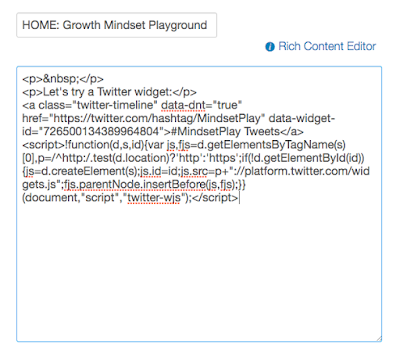 To be honest, I don't mess with this particular combination feed manually at all, but I got in the habit of using this tag-based approach because of how I use my class blog hubs, and so I used the same approach here too. And that's how I make my personal RSS combination stream using Inoreader. Personal Streams. As there is now a flurry of interest in personal APIs, I'm eager to see how this RSS-based approach compares to what people are doing with APIs. I see my web work as being basically ephemeral, and this personal RSS stream creates a dynamic but ephemeral presence (in what is almost real time). If anybody wants to see what I am doing online as I work, MythFolklore.net gives a good picture. It's not everything I do, but it sure is a lot of it! In addition, I'm guessing my use of this stream would also give me a good basis for thinking about what it would mean to shift from this RSS-based feed to something more powerful like a personal API. But that would also be more complicated... and I'll confess the 3-minutes-you're-done simplicity of setting up a combination stream in Inoreader really appeals to me! I'm not kidding about it taking 3 minutes. Yes, I love Inoreader. It takes in all the content and then lets me use/reuse, remix, and share... all thanks to the power of RSS. 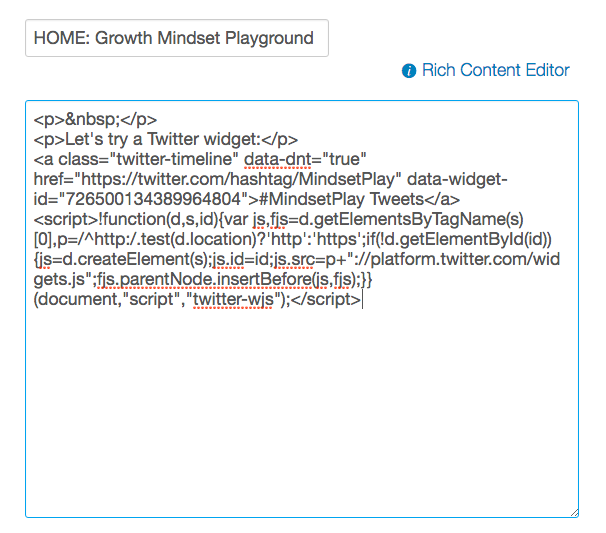 In the next post, I'll explain how it works as a search/curation tool. Preface. So, I keep my LMS use to a minimum, which means that I don't expect any really big changes as a result of this shift in LMS systems that is (probably) coming at my school from D2L (which was have had for 10 years or so) to Canvas. At the same time, I am really (REALLY) hoping that this technology change will lead to a lot of discussions about teaching -- our goals, methods, frustrations -- so that we can learn from each other's experiences and improve all our efforts. 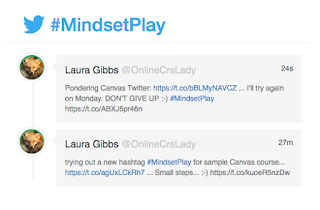 We have a hashtag for sharing at Twitter (#OU_LMS16), and one thing I am going to try to do in this series of blog posts is to document EXACTLY how I use D2L now in order to get ready for the switch. As students enroll, they show up on the roster. Since I need to keep track of lots of student information that is NOT on the Roster (and I cannot add my own data fields to the Roster), I manually transfer the first and last name of each student enrolled in the class to a Google spreadsheet. I am then able to filter for not-flagged, which shows me exactly which students I need to copy. Drops. There's also a page called "Enrollment Statistics" which shows me the students who drop (newest first), and I check that when my spreadsheet enrollment does not match the enrollment number in D2L; that mismatch means someone has dropped that I need to remove from my spreadsheet. LMS v. Spreadsheet. All the rest of the important work I do is in the spreadsheet, not in the D2L site. That's what I mean about keeping my use of D2L to a minimum. If Canvas gives me the option to add fields to the roster (and I have a lot of fields in my spreadsheet!) so that I can keep track of that data in the LMS, I might... or I might not. Google Sheets are really powerful; Canvas would have to give me good reasons to give up my spreadsheet. We'll see! What's Next? The Roster is the first thing I use in D2L, and for my Fall 2016 classes, that is all I will be using until August when I start actually setting up my classes. That means I won't have another post like this for a while, but I am glad I have this set up so that I can document my Fall 2016 classes from start to finish, week by week, as it all takes place.